The Los Angeles River is getting a much overdue makeover. About eighty years ago, the concretizing of the river formed a wall slashing through the Southland. Now, new bridges are being built, old ones are being fixed up or replaced, and new parks are being added. It’s all very exciting -- but it’s also bringing anxiety. Because with the greening of the river comes the other kind of green. “Gentrification getting over here is really surprising and shocking because you don't want your community to change, you want home to stay home,” said Ximena Hernandez, a Boyle Heights native. The group River LA is working with architect Frank Gehry’s office on figuring out a strategy for the entire 51 mile stretch of river in LA County. Concerns like Ximena’s are being heard up and down the stretches of the river that are now targeted for development. However, she said that after she talked to members of the design team, she felt better about what’s happening. “I actually got a sense of reassurance because I found out there's so many plans for the river that actually preserves the community in a smart way with nature,” Hernandez said. One site that will be up for renovation is a property called G2. It’s a 42-acre tract between the Rio De Los Angeles State Historic Park and the LA river. These two sites and the nextdoor Bowtie parcel together used to make up Taylor Yard, a rail yard. “I feel like I'm walking on the moon because you feel the presence of other people having been here. But at the same time when you're walking here there's not a lot of signs of human life still existing, but the animals and the plants are still kind of hanging on around here and it's just it's very, very quiet yet magical place to me,” said Kat Superfisky. She works with landscape architect Mia Lehrer of Studio MLA. After years of negotiations, the city of Los Angeles bought the G2 parcel last year for $60 million. The Bureau of Engineering is designing a new park, along with consulting team WSP, which includes Mia Lehrer's studio among others. Currently the G2 parcel is a field of concrete with grass sprouting through, criss-crossed by rusty rail lines and graffiti-sprayed concrete. “The soil contaminants could be very deep and we have to wait for some of the studies to be completed in order to know better how much of the soil might have to come out out of here. But there are elements like this around the site that we hope we can integrate into a park that offers many different experiences -- weddings, concerts, picnics, access to the river,” said Lehrer. “The last thing I want to be doing is creating this Disneyland moment where then hordes of people are coming to the river and it completely changes the character of what I think is the most beautiful part of the L.A. River,” Superfisky added. At the entrance to the G2 parcel is a cluster of new multifamily houses. The development is called River Park and an advertisement at the entrance says the 3 to 4 bedroom condos are selling for upwards of $600,000. According to the housing website Zillow, home prices in Cypress Park have gone up more than 18 percent in just the past year. “I think we're on the verge of what I call our pre-Highline moment in Los Angeles. And with the coming of the Highline in New York City -- a wonderful, evocative, fun project that turned an old abandoned elevated railway into a linear park, incredibly popular -- it also became a magnet for gentrification and in those areas,” said Jon Christensen, professor at UCLA’s Institute of the Environment and Sustainability who has been focusing with his students on Taylor Yard in Cypress Park. He’s also part of a new coalition called the Los Angeles Regional Open Space and Affordable Housing Collaborative, or LA ROSAH. 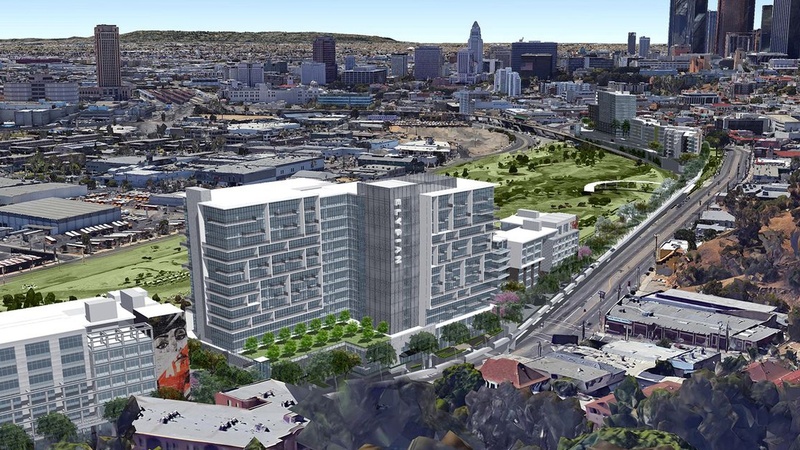 It’s focused on those parks in downtown: the State Historic Park, Rio de los Angeles, the Bow Tie parcel and G2. Design for the Elysian Park Lofts in Chinatown, a proposed residential and retail project. Rendering courtesy of Newman Garrison + Partners. Chiu says the median income in Chinatown is $19,000. 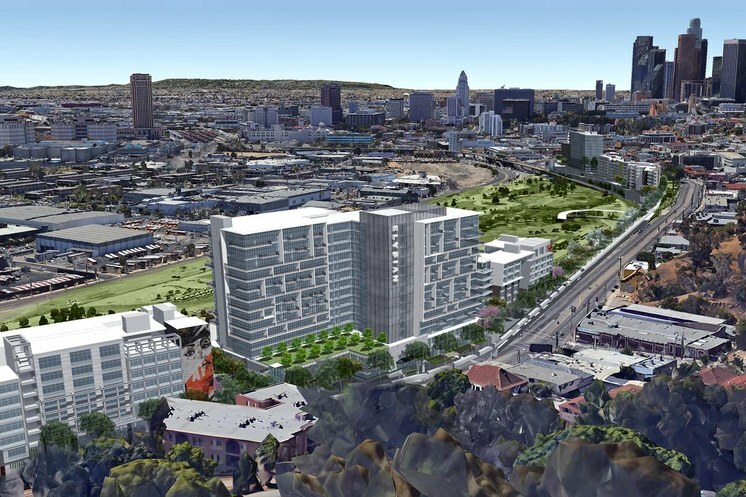 According to Councilman Gil Cedillo’s office, S&R Partners, the developers of the Elysian Park Lofts, have asked for a zone change to permit the high density residential development. But a zone change does not require them to incorporate a percentage of affordable units. Landscape architect Mia Lehrer says she too is worried about green gentrification. “What I see developing now, here, is is we're in a time of you know real I would say desperation and I can't imagine moving forward on any of these projects without trying to help solve problems, where you're not just creating housing but you're creating opportunities for jobs and stability,” Lehrer said. Follow the LA river south from downtown and you’ll find very few attractive green spots. “What you find when you go to the river is essentially a huge cement channel with the occasional spot of green that may be coming through cracks in the pavement,” said mark! Lopez, executive director of East Yard Communities for Environmental Justice. Their group spearheaded work around pollution from the Exide battery-recycling plant in Vernon, and diesel trucks from the 710 freeway. They also lead “toxic tours” by bicycle of some of the more polluted parts of the lower LA River, going from Boyle Heights and East LA all the way to Long Beach. The Metro Board has just signed off on plans to expand this stretch of the 710 freeway. One of the people who has been focusing his attention on the Lower LA River is the architect Frank Gehry. He says the challenges at the river affect the whole region, in wasted water that pours into the ocean and the social and public health. This week the LA County Board of Supervisors formally announced they’ve tapped a team to help update the LA River Master Plan. The team includes Frank Gehry, also the landscape architect Laurie Olin and the nonprofit River LA. River LA was founded as a recommendation of the 2007 LA River Revitalization Plan. A view of downtown from the banks of the LA River at Slauson Avenue in Southeast LA. Photo credit: Frances Anderton. 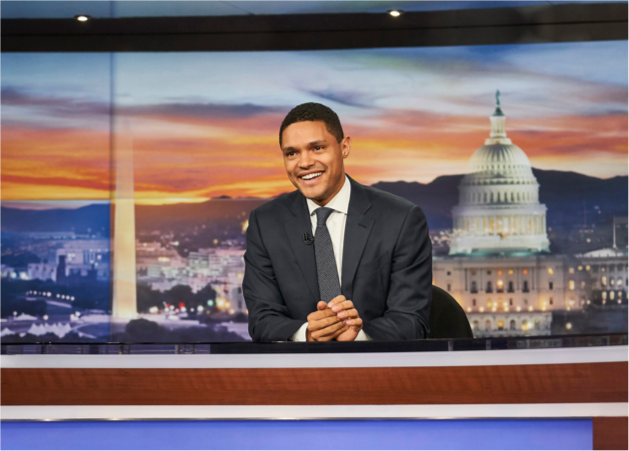 “River L.A. was created by the city of Los Angeles to be entrepreneurial in how we brought the public private and philanthropic sectors together,” said the group’s executive director, Omar Brownson. And they’ve been doing many months of research and public outreach along the river -- like the meeting Ximena Hernandez attended. “One of the things that we realized early on was that if we just tackled the river project by project and just within the city of L.A. then we weren't necessarily looking at the river as a whole,” Brownson said. The project’s base cost is $7 million -- to cover outreach, engineering and hydraulics, plan development and initial concept design. And the team leader is not River L.A., Laurie Olin or Frank Gehry. Rather it is Geosyntec, a science and engineering firm that serves as “on-call” technical consultant to the County. “When the big flood of 1938 hit, that's when the federal government realized that Los Angeles was too important to the security of the nation. We were ramping up the aerospace industry, we had World War II coming around the corner and that's when the government took a significant investment and said, ‘let's really channelize this so that does not happen again.’ And the quickest way to get water out is to put it in a very smooth container so that’s concrete and make it as straight as possible. And if you have a straight line going from the mountains to the ocean then you're going to have the steepest line,” said Mark Hanna, Senior Principal Water Resources Engineer at Geosyntec and the project leader. But, just as in Boyle Heights and Cypress Park and Lincoln Heights, the lower river communities fear the green as much as they welcome it. “This is where it potentially gets a little more contentious because the northern portions of the river have already faced some of the issues that we are fearful of and are working against, which is gentrification and displacement of lower income communities and communities of color,” said Mark Lopez with East Yard Communities for Environmental Justice. Brownson said these concerns would be addressed in the master planning process. “It's critical that these communities have a say in what is happening in their backyard,” he said. 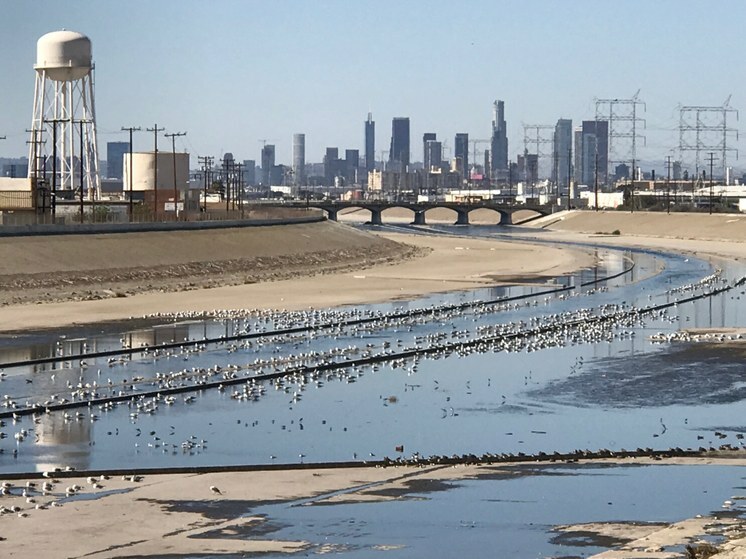 But if the LA River is a thorny and many tentacled challenge under the best of circumstances, just consider what happens when the cities it runs through are dysfunctional or mismanaged, as are several of the Southeast LA County cities that border the river. Now there is another piece to this story and it has to do specifically with concrete. When Frank Gehry first became involved with the LA River, river watchers riffed that he would encase the concrete in wavy metal. They also got the impression that he actually liked the concrete and did not want to get rid of it. “No, God no, I liked Chinatown when they did that movie with Jack Nicholson, that was kind of special. I wouldn’t fight for concrete or those kind of images if it’s impeding public health,” Gehry said. Bridges and Walls is supported in part by the California Arts Council, a state agency. And special thanks to NPR’s Story Lab. DnA: Does Frank Gehry Have the Answers for the LA River?